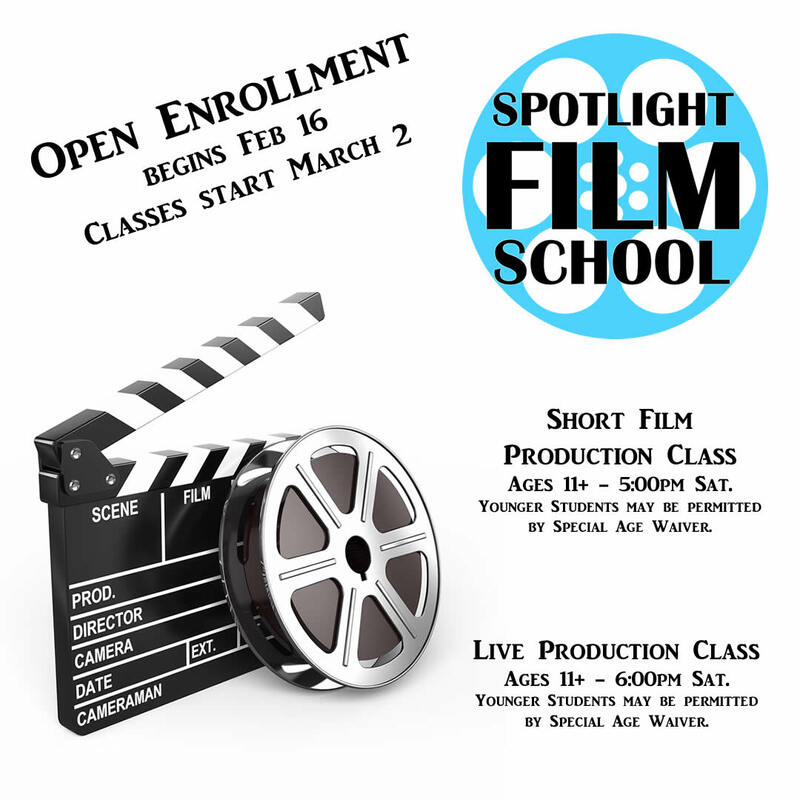 The Spotlight Film School teaches students the fine art of -performing in front of and behind the camera. This skill is a useful tool for all actors and is quite different from stage acting. Participants in the Spotlight Film School will have the opportunity to be part of an actual working production each session. Ages 11+ – 5:00pm Sat. Younger Students may be permitted by Special Age Waiver. Students will participate in the filming and production of a festival-ready short film that will be submitted to national film festivals, Roku, Netflix, and Amazon for presentation. Acceptance into any of these festivals or programs cannot be guaranteed. A film premiere will be held at Spotlight on May 11 at 8:00pm after the performance of Junie B. Jones. Ages 11+ – 6:00pm Sat. This class will teach the fast-paced and little room for error filed of live film production. This class will film live shows and podcasts for Spotlight in addition to utilizing our state-of-the-art production equipment to film live Spotlight Plays and Musicals. Many of the shows will be available online to screen the student’s progress. A collection of production highlights and mishaps will be assembled for the May 11 film premiere.